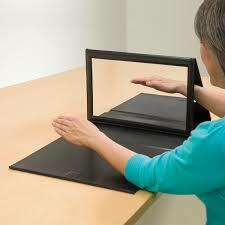 In Mirror Therapy, a mirror is placed beside the unaffected limb, blocking the view of the affected limb. This creates the illusion that both limbs are functioning properly. Damaged areas of the brain’s motor cortex may improve by viewing movements of intact, functioning limbs. Use mirror visual feedback to improve hand range of motion and function. Can be used in the clinic and home setting. The mirror can be positioned between 90 degrees and 65 degrees for individualized viewing comfort. For nearly four-decades, North Coast Medical has manufactured, supplied and distributed a broad range of industry-leading product lines across a continuum of rehabilitation medical care. A leader in Occupational, Physical and Hand Therapy medical markets, NCM services the needs of in-patient/out-patient hospitals, skilled nursing facilities, clinics, private practice, pharmacies, resellers and consumers.